Fifty-four percent of respondents to the survey, taken by Hill.TV and HarrisX, say workers should be given the day off on Election Day, allowing them far more time to vote, saving them from having to leave their polling places without voting due to long lines and issues with voting machines, and potentially changing the United States’ generally low election turnout for the better. On social media, a number of politicians and political observers voiced support for the idea. At least 12 states were reporting broken or faulty voting machines on Tuesday, including New York, Georgia, and Arizona. As a result, voters in some states were given provisional ballots—which are not always counted—while others were forced to leave polling places without voting. Reports on social media showed that voters in New York, Florida, Indiana, and Pennsylvania were among those who had to leave due to voting machine issues. PS 87 on West 78th St ALL scanners were down at midday with large crowds waiting. Voters had to leave filled in ballots in bins without scanning them. This failure of voting machines is unacceptable. Will these votes be counted? Clerk: “Be patient with us, and please come back.” – message to voters who have had to leave polls after waiting too long. Extremely long waits were also reported in Georgia, where the Republican candidate for governor, Brian Kemp, is also the Secretary of State and is responsible for overseeing the state’s elections. At 5:00pm on Tuesday, five Georgia voters filed an emergency lawsuit seeking to stop him from exercising any further power over the state’s elections. “Allowing one of the candidates to not just preside over their own election but misuse their office to give them an unfair advantage is just anti-democratic and unlawful,” said Bryan L. Sells, an attorney representing the voters, in a statement. In Snellville, Georgia, the state had evidently not provided a polling location with power cords for the voting machines, leaving voters with no way to cast their ballots after the machines’ batteries ran out. Both reports drew ire from critics who in recent weeks have decried a number of voter suppression efforts by Kemp’s office—including the attempted closure of polling places in majority-black areas and an attempt to disenfranchise 53,000 mostly-black voters for clerical errors on voting forms. Voters in Georgia also reported that they had been turned away at the polls despite presenting photo IDs that are ostensibly accepted forms of identification for voters in the state. Reports of difficulties casting votes are common on Election Day in the U.S.—and stand as incontrovertible evidence, critics say, that the country’s democratic system is broken. It’s hard to blame people for losing faith in the system when you see images of long lines, broken machines, lack of power chords. Is voting meant to be an obstacle course? The reports also intensified demands that the U.S. should demonstrate the same respect for the democratic process that countries including Mexico and France do—by ensuring that voters can make their voices heard without having to worry about getting to work. 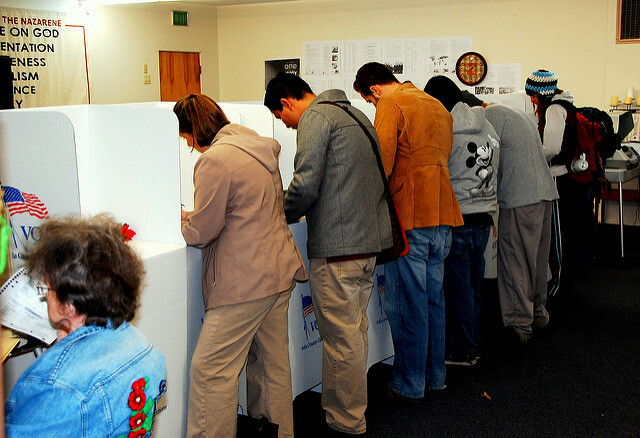 Reports of broken voting machines, long lines, locked precincts…absolutely ridiculous. This country is a joke when it comes to encouraging electoral participation. Election Day should be a holiday, and there should be 3-5 times more early voting stations as well. Election Day should be a national holiday (Democracy Day perhaps? ); it should be illegal to use voting machines that do not have an auditable paper trail; more states should adopt automatic voter registration; and there should be a legal limit to average wait times per precinct.